Leonard Smith's animal photography transformed into beautiful cards and stationery. Perfect for the animal lover and ideal gift material. Notecard Wallet Sets are a versatile stationery pack containing ten cards and envelopes in an attractive box. 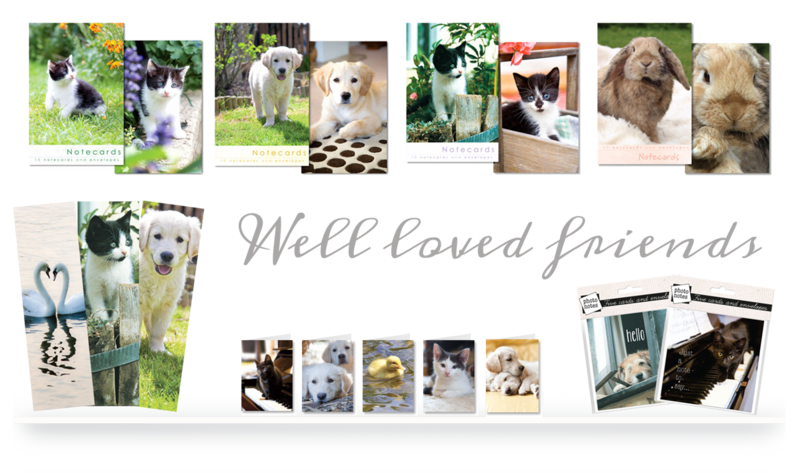 Ten cards, two designs per pack and really handy to use as 'notecards', 'thank you' cards, 'thanks for looking after the pet' . . . or just because they are great quality products featuring a picture of your favourite animal! Leonard has captured the character and personality of our well loved friends. Ranges featured above include Bookmarks, Miniatures and Photonotes. Miniature cards make a lovely alternative to a gift tag, with plenty or room for your message and an envelope. Photonotes are our most recent addition to the greetings card set and contain five cards and envelopes per pack They are printed on quality Italian textured board and they are the perfect way to just say 'hello' or drop in 'a note to say' . . .
To view the full range please enter the Online Trade Catalogue. Or return to the Our Cards menu. Sometimes the expressive faces of our pets and animals are the most perfect way to say it! 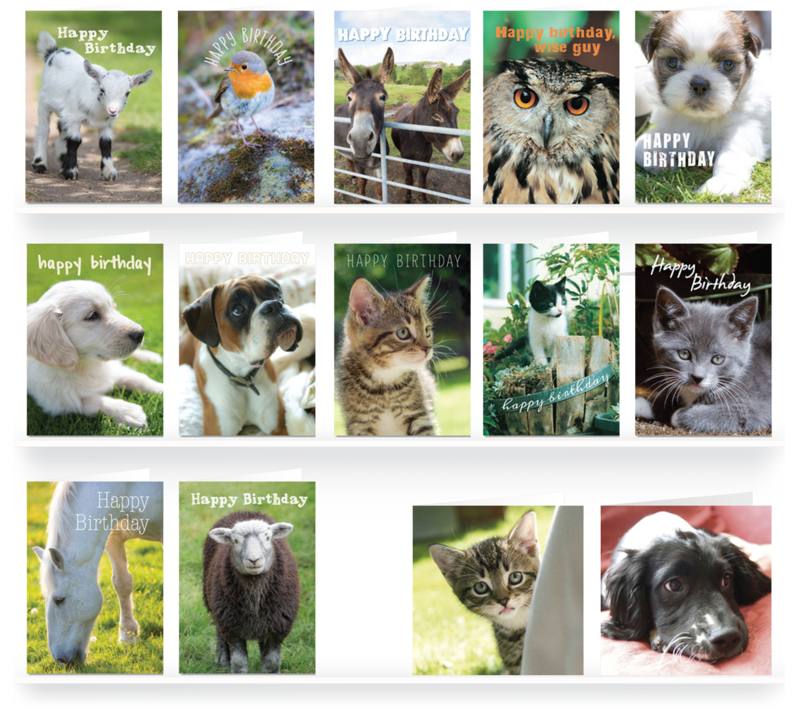 Animal birthday cards in this range include some more unusual pets and wildlife - lambs, donkeys, a robin and an owl. Something for everone. As well as the Classic 5x7 range we have two animal cards in the Blink range - a tabby cat and a Springer Spaniel. 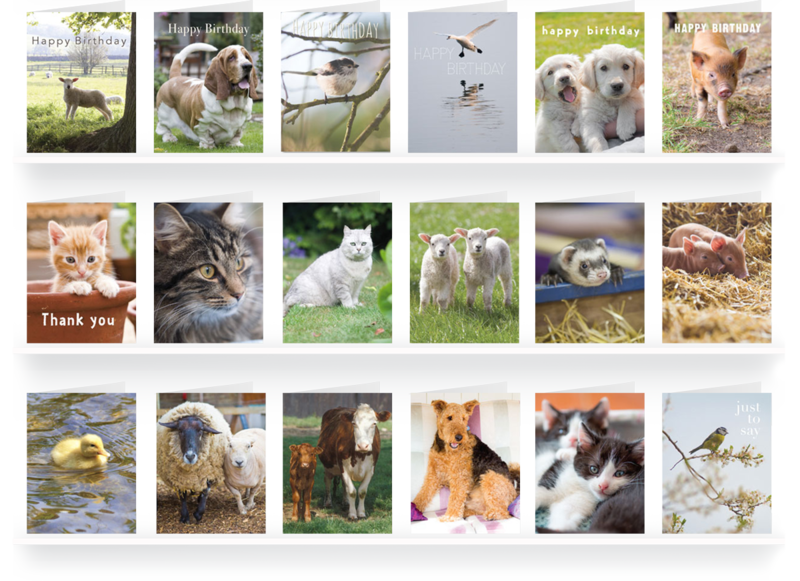 In case you can't find your favourite animal in the Classic 5x7 range, you might find exactly what you're looking for within our Small Card range. With sharp, detailed photography of cats, kittens, dogs, dogs and puppies, duckling, sheep, birds, pigs, cows and a ferret. There are six animal 'happy birthday' cards, a thank you, just to say message and several blank for your own message.